Event: WebinarIs Your Website Optimized for Patient Acquisition? 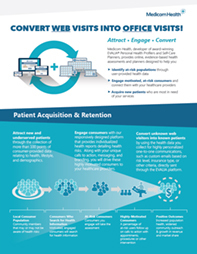 Discover how interactive content can enhance hospital website lead-generation. One stat shows that 96% of visitors that come to your website are not ready to buy or connect. What can you do to move them down your patient acquisition funnel? One way is to provide content and tools that adapt to your visitors’ needs, rather than static content. Presented by Shawn Gross, VP of Digital Transformation, ReviveHealth. Join us to hear Shawn discuss how and why interactive tools can grow conversions and fuel personalized nurturing the way Big Consumer Brands do. Shawn will share various tips, hacks, and examples from his agency and hospital experience – including dead-simple takeaways to level-up your lead-generation game. All registrants will receive a link to a recording after the webinar.